C. difficile spores are resilient and very difficult to kill and remove from these surfaces. Detergent-based cleaners are not capable of killing C. difficile spores. Nursing homes must use a cleaning solution that contains bleach which is strong enough to eradicate these resilient C-diff spores. Gastroenteritis is a common gastrointestinal infection in nursing homes. Gastroenteritis occurs when someone has bouts of either diarrhea or vomiting. Two or more loose stools in a day qualifies as diarrhea. Gastroenteritis outbreaks are very common in nursing homes. A bacteria named Clostridium diﬃcile (C. diﬃcile) is the most common cause of diarrheal infections and gastrointestinal infections in nursing homes. Diagnosing Gastrointestinal C. difficile infections can be difficult. Approximately 4% to 20% of nursing home residents with C. difficile gastrointestinal infections do not have any symptoms. Residents that do have symptoms often have a fever, stomach pain, nausea, decrease in appetite, and watery diarrhea. Patients that have a C. difficile infection might not have any symptoms and others may experience life-threatening inflammation of the colon or digestive tract. Over 80% of C. difficile infections occur in adults over the age of 65 due to decreased levels of gastric acid. C-diff is usually contracted by nursing home residents that have recently used antibiotics. Antibiotics are prescribed to kill the bacteria that cause infections. However, antibiotics also end up killing healthy intestinal bacterial microbes that help our bodies naturally prevent and fight infections. As a result, the body’s immune defense system is weakened when these microbes die off which makes it much easier for infections to occur. Roughly 10% to 30% of all nursing home residents that are treated with antibiotics will contract C. difficile. Other major risks of C. difficile infections include recent antacid use, past antibiotic use, underlying chronic disease, heart disease, diabetes, asthma, or COPD (chronic obstructive pulmonary disease); ventilator use, nasogastric tube use, intravenous feeding tube use, decreased functional status, increased age, dementia, recent fall accidents or a recent stay in a hospital. 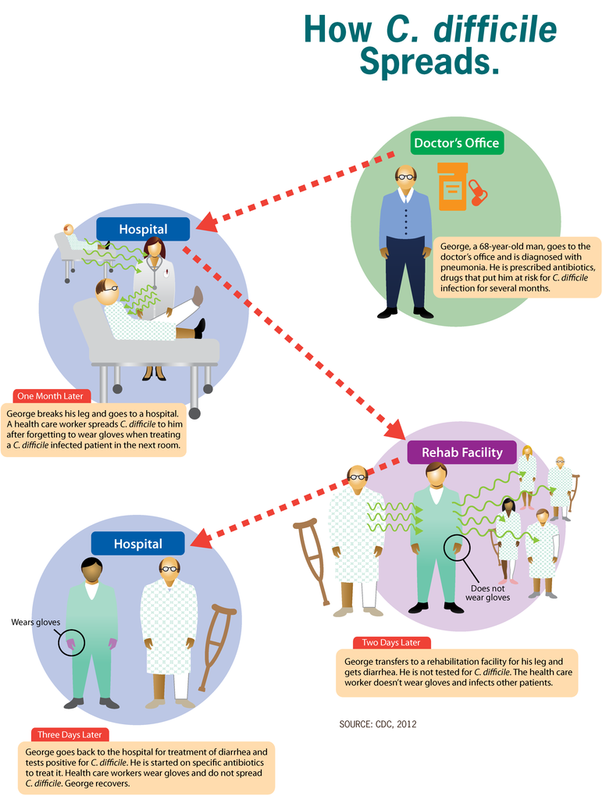 C. difficile can also be transmitted through hand-to-hand contact between nursing home residents and between staff and residents. Nursing homes often have crowded living conditions, shared dining areas, poor hygiene due to functional limitations, and shared medical care. These conditions make direct transmission a common and serious risk. It is important for nursing homes to diagnose C.diff infections in a timely manner. A delayed diagnosis will result in delayed treatment. Most every nursing home has the ability to take blood samples from residents and have them tested. Residents with a C.Diff infection will have an elevated white blood cell count. When C.Diff is suspected a nursing home must order timely blood tests and immediately transfer the patient to a hospital for antibiotic treatment if the blood tests shows a sufficiently elevated white blood cell count. Common alcohol-based hand sanitizes are not able to kill C. difficile spores. Hand-washing with soap and hot water is the best way to remove spores from hands and skin. Nursing homes need to instruct staff on proper hand cleansing techniques and should post signs near medical carts and in bathrooms to ensure compliance. C. difficile spores can also transfer to nursing home bed rails, toilets, bedpans, door handles, furniture and medical equipment. C. difficile spores can survive on these cold surfaces long enough to contaminate large areas of nursing homes. The Environmental Protection Agency has created a list of disinfectants it recommends for cleaning surfaces in contaminated spaces that provide medical treatment like nursing homes, assisted living facilities, rehabilitation facilities, hospitals and long-term care facilities. Nursing homes must use proper disinfectants and cleaners to prevent the spread of infections. Did your loved one suffer a serious infection as a result of nursing home neglect? We can help. It is important to work with a personal injury attorney to investigate the circumstances surrounding your loved one’s urinary tract infection in order to determine if the nursing home has any liability. To learn more about legal actions in cases involving nursing home neglect or sexual abuse of elderly patients, contact our law offices today for a FREE legal consultation, where you can find out more information about whether or not the nursing home facility might be liable for compensation. Our experienced team of personal injury lawyers can help evaluate the circumstances of an injury to help you determine if compensation might be available to you. 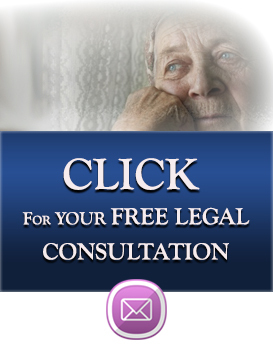 Massachusetts Elder Abuse and Nursing Home Neglect Personal Injury Attorneys, Free Consultation. No fee if no recovery.